While media attention continues to focus on the racial issues in America’s biggest cities and its most racially diverse regions, newly released census data make plain why we need to expect a more racially diverse America everywhere. It is because the rapidly aging U.S. white population is no longer contributing to gains in the number of the nation’s youth. The new statistics, for July 2014, show that the median age of whites has reached an all-time high of 43.1, while the national median age is 37.7. For Hispanics the median age is 28.5, and for those of two or more races it’s 19.8. The impact of white aging is especially pronounced within the population under age 20. Among this group, which includes late millennials, now in their teens, and the emerging post-millennial generation, there was an absolute decline in the number of whites between the 2010 census and 2014 (see figure). As I show in my book, Diversity Explosion, the decline in the population of white youth was already apparent in the last decade. Whites have not stopped having children (their fertility is slightly below replacement), but the aging of their population means that proportionately fewer white women are in the childbearing ages. Going forward, more whites will age out of the nation’s younger population than will be born into it. The new data show that this pattern is persisting and, at least for the near term, leading to small declines in America’s younger population overall, since minority gains among the under-age-20 population are smaller than white losses. Both patterns, declines in the number of all young people and declines in the number of young whites, are pervasive. Between 2010 and 2014, 46 states registered losses in their under-age-20 white populations and 37 showed declines in youth overall. (see table) Among the 14 states (including D.C.) that gained youth, most achieved those gains because white losses were more than counterbalanced by minority gains. This was the case in Texas, which led all states by gaining nearly a quarter of a million young people—and minorities, especially Hispanics, accounted for all of that gain and then some. In only a handful of states, including Utah, North and South Dakota, and Hawaii, as well as D.C., did whites contribute to total youth gains. More important is the fact that all of the 37 states experiencing losses in their under-age-20 populations experienced white losses that minority gains could not counter. The loss of white youth pervades communities within states as well. Among the nation’s 100 largest metropolitan areas, 59 experienced losses in their under-age-20 populations, and all of those except one (El Paso) registered white youth losses. (see table) Overall, 84 of the 100 metro areas lost whites under age 20, including 26 that gained youth overall, because minority youth gains more than cancelled out those losses. Yet as with states, several migrant-magnet metros, including some in Texas, such as Houston, Austin, and San Antonio, and others in the South and West, such as Denver and Raleigh, are gaining white and minority youth. 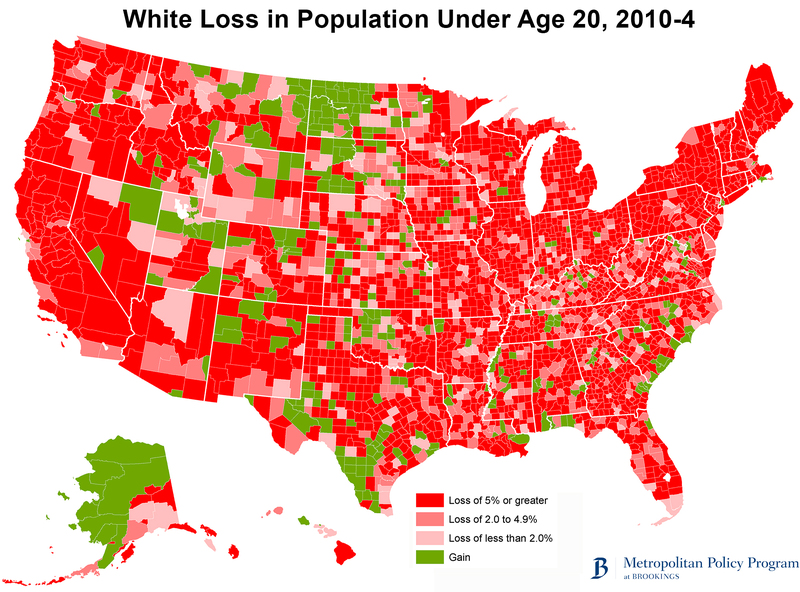 The pervasiveness of white losses among the nation’s youth is most vivid when looking at the nation’s 3,100-plus counties (see map). Eighty-eight percent of counties (2,780) showed a loss in their under-age-20 white populations between 2010 and 2014. These include large swaths of rural and urban counties in all parts of the country. And while some counties have youth populations that are much “whiter” than others, the vast majority displayed rises in the minority shares of their populations since 2010 and especially since 2000. The aging and eventual numeric decline of the nation’s white population is a demographic fact of life. The Census Bureau’s recent population projections indicate that there will be an absolute decline in our white population after 2026. However, these new Census estimates show that white decline is already occurring for the population under age 20, not only nationally but in broad regions of the country. The nation’s youth population is projected to show modest gains over the decades to come, but only because of greater growth for today’s younger minorities, whose gains will counter the continuing declines of younger whites. Already in 2014, the population under age 20 was 47.8 percent minority; this share will rise to 52 percent in 2025 and to 55 percent in 2035. Because tomorrow’s increasingly minority-driven youth and labor force population will be vital to maintaining a robust economy and to supporting a much more rapidly growing senior population, it is important to pay attention to the needs and opportunities available to the highly diverse post-millennial generation—not just in selected parts of the country, but everywhere.